By 4 to 5 million years ago, early humans were well and truly on the bi-pedal approach. It seemed walking on two feet was a necessity during a time when environmental changes in Africa resulting in a more open savannah landscape may have favoured such creatures. Perhaps the need to raise one's head high in the air on a continuous basis while walking had helped our ancestors to observe the extra competition from other primates as well as the predators? While the Himalayas did contribute somewhat to the environmental changes taking place in Africa, it is felt that the changes near the equator and further south were a little too dramatic at this time to be caused entirely by climate change. The great African rainforests were suddenly shrinking in size, driving more and more of the early "human-like" primates from the rainforest tree tops and onto the drier and harsher savannah landscape. Today, the only remnants of this great African rainforest may be found in difficult-to-reach places such as the Congo along Africa's central west coast. Before more sunlight reached the ground, primates (including the evolutionary branch that would lead to humans) were naturally nocturnal creatures. As time passed, and with fewer trees on the African continent, the primates slowly became specialists in gathering food during the day and sleeping at night. Later this would be supplemented with more foraging of food on the ground before running back to the safety of the trees. Certainly at some point, these inquisitive creatures with little to protect themselves from the predators have to make the journey from one tree to the next to find more food. While it may be true that life for our early ancestors might be getting a little easier at this time, it is believed we were still on the predator's menu thanks to sabretooths, giant carnivorous bears, lions, leopards, wild dogs and giant birds of prey. Richard Coss, a psychologist at the University of California, argues that the transition from being hunted to the hunter stage has not been a particularly smooth one. He believes our ancestors had encountered numerous predators of which many were detrimental to humans in the early stages. But as time went by, humans developed better muscle co-ordination, started walking on two feet, used a communicative language for organising whole groups of hominids to achieve a common goal, built a technology and many other "human" characteristics and tools to help deal with the predators. Thus Coss has surmised that all our technology, socialisation, language, the aggressive behaviours displayed by males, our social values of trust and loyalty, our need to hoard as many tools as possible, and even many of our deepest fears and phobias are all part of our evolutionary hangovers from these ancient times when humans had to deal with the predators. As further evidence, many people are still likely to be startled to this very day whenever movies from Hollywood producers depict predators on the big screen despite the safety of our modern society. And what about the general tendency for males to be aggressive when solving problems? Could we have learnt this now instinctual behaviour in the males species over millions of years? Nearly 4 million years ago, hominids called Australopithecus walked the Earth. They had a skull structure slightly more human than ape to be considered a likely early ancestor. 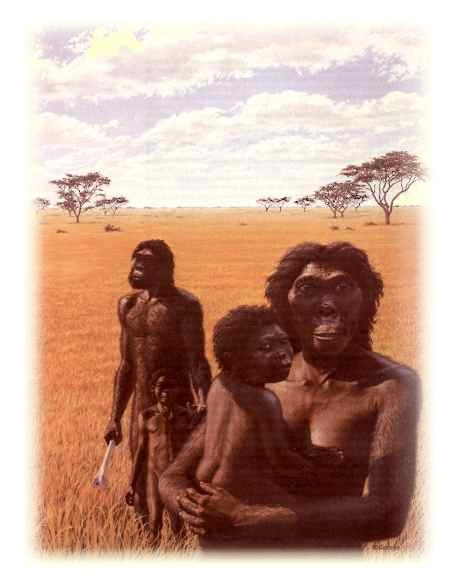 Artist impression of a family belonging to the Australopithecus lineage. Source: Reader 1986, p.179. These early hominids were small social creatures of 1.2 to 1.5 metres in height. The number of fossils found for this species so far would suggest they lived in eastern and southern Africa. They walked on two feet (with slightly bent legs) with a brain no larger than a modern chimpanzee (or roughly one-third of a modern human). Although characteristically ape-like in appearance, primitive human-like features can be observed on the skull structure including a low forehead, a relatively large forward-jutting jaw, and small canines not projecting well above the other teeth. They also had widely-separated cheekbones but this could be due to the way the smaller skull size and larger jaw structure helps to exaggerate this feature. In terms of the way this species lived in the environment, the Australopithecines probably retained their ancestral instinct to climb trees as observed in the curvature of the finger and toe (based on an analysis of the remains of a 40 per cent complete 3.18-million-year-old (4) skeleton nicknamed "Lucy" from Ethiopia, Africa). To allow primates to free two limbs - one to hold and the other to manipulate - so they may build and use tools needed to make the task of acquiring food and fending off predators and other primate groups easier to perform. "Australopithecus became a superior omnivore, able to eat tubers and roots with more fibre and grit, adapting it better to times of scarcity during periods of extended drought. Fruit and nuts remained a staple for these hominds. "We know [Australopithecenes] it is a human ancestor because we have indication that they walked upright like us." Although there is every possibility other upright walking hominids could have been our ancestor at this time, the numbers of these Australopithecenes in Africa has given scientists reasonable confidence we probably evolved from these creatures (or had some of its genes intermingled with a more direct descendent to humans with upright-walking capabilities). Scientists discover embedded in 3.7 million year old volcanic ash footprints in Tanzania during the mid-1970s. What makes these footprints special is how they were produced by human-like creatures walking on two feet (possibly our own ancestors). This has to be clear evidence that a number of hominid creatures (and certainly those leading to modern humans) were already walking upright by this time. Professor Gunther Korschinek and his scientific colleagues at the Technical University of Munich, Germany, have found stardust deep beneath the Pacific Ocean dated to this time. The discovery suggests the Earth was showered by this stardust material and higher levels of cosmic rays for up to a period of 300,000 years (5). The consequence of this is that any increase in cosmic rays reaching the surface of the Earth can affect the genetic material of early humans more readily. So the scientists have suggested the possibility that such rays could have assisted in the evolution of humans during this time. Or it could have been detrimental to humans. Those humans born with deformaties most likely died through natural selection. Nevertheless where humans were born with unusually good characteristics were more likely to breed, resulting in the modified genes being transferred to future generations of humans. Either way, the importance of radiation from various sources in modifying our genes cannot be discounted. Radiation does shape human evolution. Did humans gain new characteristics soon after being exposed to the cosmic rays from an ancient supernova? A scientific study of the fossilised bones of 324 baboons and 140 australopithecines uncovered during this period have confirmed that many did bear the marks of encounters with predators. The marks look typical of tooth and claw damage, especially of the big cats and predatory hyenas variety (6). It would appear our ancestors were more prey than predator during this time. The group structure of Australopithecus is most interesting. Apparently, Australopithecus males would often stick in one group for all their lives. Females, on the other hand, were more likely to move to different groups. This ensures inbreeding within the species is minimised. Australopithecus were scavengers of dead animals to help supplement their standard plant diet of leaves, roots and fruit. An increase in meat consumption would go hand-in-hand with an increase in brain size because of the extra nutrients (e.g. protein and fats) in the meat needed for the brain to develop and grow. It would be another 2 million years before humans would learn to speak in a highly sophisticated and rational way and hence develop the necessary level of social organisation and technology capable of defending itself against virtually all great predators. Africa was experiencing a 10,000-year drought during the Pliocene epoch at around this time. According to some scientists, it was enough to devastate the gorilla population in southern Zaire and so allow a new breed of chimps to carve out an existence. Some scientists believe it could also have affected early humans causing our bodies to adapt and find ways to get through periods of famine until the next period of abundance. The drought is thought to be a natural cataclysmic event. The great drought in Africa may have seen the emergence of the first meat-eating and stone tool-wielding hominid known as Homo Habilis making its mark in this relatively inhospitable and dry environment. By 2.3 million years ago, the numbers of these hominids were enough for modern humans to pick up some bones to make an analysis and put a name to this new species. It is unclear whether Homo Habilis invented fire for themselves and used the heat to cook the meat. We must assume the species ate mostly raw meat with limited amounts of plant materials unless bushfires provided some of the natural means of cooking the meat for these hominids. The number of bones found of this species could also suggest its genes may be a part of modern humans given its advanced intelligence and ability to create and manipulate tools. Africa continues to get drier. At this time much of the northern and eastern continent looked like grassland dotted with trees. No longer do we have the thick forests of the past as early hominids enjoyed. And now some scientists believe they may know why. Apparently the tilt of the Earth is different at this time compared to today and is such that the polar ice caps could not melt properly in the summer time. The result is a locking up of more water as polar ice caps reduced the humidity in the air and with it the general rainfall in continents like Africa. Despite the drier conditions, at least half a dozen different species of hominids appeared at this time. The large variety of hominids would coincide with a great diversity of animal life especially on the African continent, both of the familiar and unfamiliar types. Of all the hominids present at this time, the oldest known artificially-made tools were definitely fashioned by Homo Habilis (although one could argue modern chimpanzees with less brain power than Homo Habilis can fashion a tool of their own and use it to affect the environment such as picking out honey from a tree trunk or cracking nuts, suggesting hominids earlier than Homo Habilis should have had this ability as well). From an abundant supply of stones and wood in certain parts of the European and African continent at this time, these hominids used their hands to create simple knifes and spear implements to improve hunting techniques and/or cut up meat scavenged from dead animals and later discover a means to fend off invaders and predators from a prescribed territory. Studies of skull and bone fragments suggested Homo Habilis were slightly taller and had a fractionally larger brain capacity than their predecessors, Australopithecus. But this could end up being a "chicken or the-egg" situation. For example, a chimpanzee can quickly learn to cusp its hands into the shape of a bowl for temporarily holding food or water. Or why not a piece of bark for the same purpose? Some chimpanzees are even smart enough to select and even mould with its hands a piece of bark to gather food or water more efficiently. Since eating and drinking has to be performed more regularly and early in life compared to defending against predators (or even hunting), one could argue the tools were probably developed for gathering food first. Whatever the truth, certainly by the time humans did start making tools, they would have eventually seen the value of using the tools both as a means of defending themselves against the predators and as a means of hunting and gathering food. As these changes were taking place among the hominids, the original and thick gondwanic rainforests covering much if not all of Australia for literally many millions of years according to pollen records obtained from a number of sites around Australia, became only a minor part of Australia's vegetation by around 2 million years ago. More open and drier temperate forests would dominate this continent. The trend towards a diminishing rainforest size seems to be common in other parts of the world. For example, in Africa, the great rainforests covering much of the continent was shrinking in size (or dispersing might be a better word) nearly 5 million years ago as a result of climate change caused by some natural event. Perhaps the Himalayas is having a greater effect on climate? Or probably a combination of a more significant tilt of the Earth's axis as well as mountain building is the cause? But why would Australia by affected by the climate change? It is certainly not in the rainshadow of the Himalayan mountains. The planetary tilt theory might explain some of it. But there could be a deeper reason. We know that Australia is such a geologically inactive continent that what Australian people today call the mountains along the eastern seaboard had now being weathered away sufficiently to very large hills by the wind and rain. Once the continent had a reduced mountain range, the likelihood of cloud formation occurring over these "hills" would probably be reduced with rain becoming less and less frequent and more unpredictable. Only a large inland sea at the centre of Australia could maintain any resemblance of reasonably reliable rainfall on the mountain ranges. However, as the trees diminished, the likelihood of maintaining the great inland sea would have got more difficult over time. Should this inland sea disappear altogether, Australia would turn into the driest continent in the world and one of the most difficult places for humans to grow food and survive easily. No wonder Australians today find it hard to grow a decent crop when water becomes scarce (or excessive amounts on the rare occasion when sufficient rains return during what is known as the El Nina event where warm Pacific waters finally reach the eastern coast of Australia). Turning back to the hominids in Africa, especially those that would eventually lead to the existence of humans, there existed another interesting hominid species from East Africa nearly 2 million years ago known as Homo Augasta. These hominids had a more familiar human appearance compared to Homo Habilis, had a larger brain, were better adapted to a changing environment, produced the Rolls Royce of stone tools (e.g. axes), had greater social skills, developed the beginnings of a rudimentary verbal language for communicating with each other as needed for better survival, and had the sophisticated tools and knowledge to reduce competition from other hominids and a number of predators. We owe our large brains directly from Homo Augasta. In fact, the moment these prehistoric humans walked the earth and learned to develop important relationships with other people through language and getting together on a social level to achieve common goals and hence a chance to organise the group to perform specific tasks, the brains of Homo Augusta had to expand because of the range of extra patterns needed to be learnt through language and other skills as required to survive not only in the harsh environment, but also within the group itself. Australopithecus may not have died out at the time Homo Augusta came on the scene, but there are indications that the former were on the decline. It is unclear whether natural events or competition with the new hominds is the cause for this. A discovery by a nine-year-old son of a scientist in a cavern 40 kilometres from Johannesburg, South Africa, of two near complete skeletons dated 1.9 to 2 million years old suggests the early Australopithecus of 4 million years ago had evolved features lying somewhere between the early Australopithecus and the early hominids of the first human-like Homo Sapiens. For example, the arms remained more ape-like, but the hands look more human by being shorter in length. The hominids could climb trees, but the pelvis and long legs evolved in a more human-like form allowing the two hominids to walk efficiently and easily like a human. Even its teeth were smaller and looked human-like. Another change could be seen in the brain. According to Professor Lee R. Berger, a paleo-anthropologist at the University of Witwatersrand in Johannesburg, he noted the brain was more ape-like in terms of size being approximately one-third of a human (estimated to be about 420 cubic centimetres). However, the shape of the brain appears to have evolved from other species of Australopithecus. Categorised as Australopithecus sediba, Berger would best describe these two hominids as "a mosaic of features demonstrating an animal comfortable in both worlds". The skeletons represent a female in her late 20s or early 30s of 1.27 metres in height and probably weighing 33 kilograms, and a 11 to 13 year old boy of the same height and weight about 27 kilograms. It is unclear how the two skeletons died. Scientists believe the pair may have died within days or hours of each other and could be related. "The fossils demonstrate a surprisingly advanced but small brain, a very evolved hand with a long thumb like a human's, a very modern pelvis, but a foot and ankle shape never seen in any hominin species that combines features of both apes and humans in one anatomical package." "We can conclude that this new species shares more derived features with early Homo than any other known australopith species, and thus represents a candidate ancestor for the genus." "We have the most complete hand from one individual, from any species of early human ancestor ever discovered and it's a lot like ours, with its shortened fingers and its long thumb. We're getting a vision into the moment where our grip, the thing that makes us so unique, that allows us to play piano, to paint a picture, type on a computer, make a stone tool or shake hands, evolved. It's amazing to see that, particularly on the end of an arm that's like an ape." More work will need to be done to determine exactly where the skeletons fit into the great family of hominids and apes. Until then we have yet another tantalizing piece in the jigsaw puzzle. Further details available in the Science journal of April 2010. The fossilized remains of a female and young boy categorised under the term Australopithecus sebida has now been dated to 1.977 million years old, making it one of the earliest if not the earliest fossilised remains of a species that could well have direct lineage to modern humans. So far no one has been able to find evidence to not link the species to modern humans at the present time. The skull of a fossilised individual found in a South African cave and now classified as Australopithecus sediba has stirred considerable interest among the scientists. Photograph by Brett Eloff, courtesy of Lee Berger and the University of Witwatersrand. Details of the dating analysis is revealed in the Science journal published in September 2011. The dating work involved a combination of uranium lead dating of the flowstone above and below the bones by Dr Robyn Pickering at the University of Melbourne, while a group of scientists at La Trobe University performed what is called a paleomagnetic analysis of sediments surrounding the fossils. Scientists discover a paleomagnetic reversal, an occurrence where the Earth's magnetic poles reverse positions, according to geophysical surveys of the magnetic patterns recorded in rocks on the sea floor. Between 1.77 and 1.5 million years ago, the north pole was actually over Antarctica and the south pole near the arctic region. A group of people who first moved to Europe, known as the Neanderthals, existed at this time. Based on a combination of genetic, fossil, archaeological and other sources of information, scientists are now considering the very high probability that the Neanderthal people may already had the genes to support speech (and hence a communicative language). So when these people split from our ancestors in Africa during the emergence of Homo heidelbergensis and another group called the Denisovans, it is likely the Neanderthals and our original early ancestors living at this time already had the capability of speech and were communicating using a rudimentary language. "Modern humans and Neanderthals and Denisovans are very similar genetically, and there are indications of interbreeding as well, strengthening this similarity," lead author of the study Dan Dediu said. He believes a gene involved in language and speech known as FOXP2 is present in all three groups..
As for the origins of human culture, Dediu further adds that the development of a language, no matter how primitive, would have seen the emergence of a culture among the group of people who prized speech and a language system. Furthermore, as language evolved so did the culture and vice versa. In other words, there was no need to wait for evolution in order to make the necessary changes in biology to allow for speech and the development of a culture. Humans probably forced the changes by seeing the advantages of speech and providing a basic language for communicating. Then culture just grew from there thereby paving the way for more sophisticated language and hence co-evolving over time to the state we see today. "Recent discoveries and reinterpretation of the Neanderthal archaeological record support its capacity for symbolic culture (including their) complex toolkit, complex social life and its capacity to persist in the harsh and fluctuating western Eurasian climate of the time. "The basic idea is that cultural change is not simply an effect of a better genetic background; culture does not have to wait for biology change, but culture generates new selective pressures to which our biology must adapt, changes in biology that might allow new cultural changes in a co-evolutionary cycle." Dediu is a senior investigator in the Language and Genetics Department and is the principal leader for a project called "Genetic Biases in Speech and Language" aimed at determining how far back the gene for speech may have existed in humans. The study is based at the Max Planck Institute for Psycholinguistics. What would the first speech have been like by early humans? Mark Sicoli, an assistant professor in Georgetown University's Department of Linguistics, suggested they probably whistled (an effective means of carrying basic information over reasonable distances) in a variety of different sounds to indicate different actions and behaviours to perform and/or to indicate what was needed, the remnants of which still exists among people in parts of Oaxaca, Mexico. "If our proposal is correct, then we might not only carry some Neanderthal genes in our own genomes as traces of our past encounters, but also our languages might as well preserve some faint signature of their languages as well, but until rigorous testing is attempted, this must remain pure  even if exciting  speculation. Some scientists speculate that the "drying up of Africa" would actually coincide with a supernova explosion nearly 2.8 million years ago causing the Earth to heat up slightly and evaporate enough of the moisture to turn the continent into a dry savanna landscape as we see today. If this is true, then why did the Earth retain so much rainfall over the continent during the Jurassic period despite being much warmer than it was 3 million years ago or even today? What is maintaining the dry conditions on the continent to this very day? Mountain-building? Volcanoes? More supernovas? Or the arrival of a new species called humans? Perhaps the clues can be found by the way animals and humans graze for food and firewood near the fringes of the Sahara desert today. Or are we living in a period of increasing dryness and high temperatures because of a continued natural event occurring to this day? Perhaps we need to ask these scientists, where's the supernova explosion maintaining these current dry and hot conditions on the planet Earth? The age has been placed to within plus or minus 10,000 years using recent advances in the potassium-argon dating technique, which allowed scientists to date the layers of volcanic ash where Lucy's body was found. Evidence for the existence of this stardust on the Earth and the timing for when it was deposited on the Earth's surface was determined after scientists understood the major composition of stardust is the radioactive element known as iron-60 and has a natural decay rate, or half-life, calculated by the scientists of approximately 1.5 million years. You see, all ancient stars undergoing a supernova explosion will always contain high amounts of heavy metals in their chemical composition of which the highest quantity is iron. Iron is what made the Earth. And life cannot exist without some iron in its own chemical composition. So we should expect stardust to contain iron in reasonable quantities. Iron is a by-product of the intense nuclear fusion reactions that occur at the core of stars. So when scientists managed to find a preserved layer of unusually high quantities of the radioactive element iron-60 underneath the Pacific ocean but not in the magma part of the Earth, scientists had no choice but to accept this as evidence for stardust. And because iron-60 has a decay rate, or half-life, of 1.5 million years, scientists have pinpointed the timing for this supernova explosion at around 2.8 million years ago. Grimes 2002, p.35. 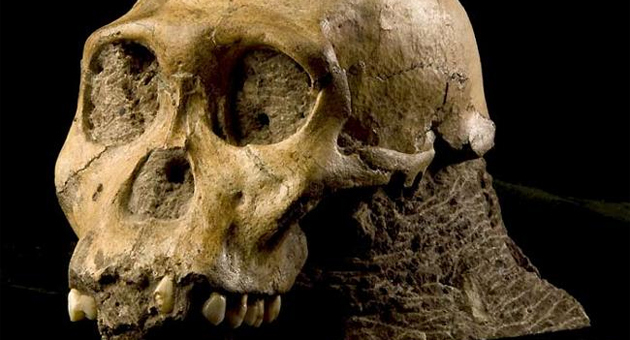 Scientists studying the skull of a 2 million year old toddler known as Taung Child have found evidence of puncture marks in the base of the eye socket. After looking at the way modern eagles eat their prey (including small primates) and the damage left behind in the eye sockets, Dr Lee Berger of the University of the Witwatersrand in Johannesburg, South Africa, will conclude in a report expected to be published in the American Journal of Physical Anthropology that the child had died after being picked up by an ancient predatory bird (possibly an eagle or a flightless creature with a beak), taken to a nest, its eyes were ripped out, and eventually eating alive. Second image is a reconstruction of a fairer-skinned couple version of Australopithecus based on fossils found in Africa. Source: Tattersall 1995, p.39.